Layers enable you to choose the stacking order of content within a given scene. This ability to control where an item appears along the z-axis - as opposed to the x-axis and y-axis - determines whether that item will appear in front of or behind other items. These layers are specific to a scene. There must be at least one scene layer in each scene but there is no maximum number of scene layers. These layers are global to an experience so they are visible in all scenes by default, but you can choose which scenes should hide/show their content. It is not necessary to use them - though they have some advantages - nor is there a maximum limit. Regardless of a layer's location, its visibility can be toggled via triggers. In addition, scenes can specify whether or not to include particular experience layers. 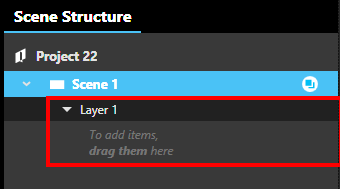 Scene layers are scene-specific and are typically used to control the stacking order of items unique to that scene. During scene to scene navigation, content across all scene layers are affected by the chosen transition effect. Thus a video located in two scenes, if playing in the first scene, will stop and then restart playing after scene to scene navigation. Experience layers are global to an experience and can thus appear in all scenes. They are most commonly used to create foreground and background elements that are shared across multiple scenes. The concept is similar to that of a slide show master template although experience layers offer more power and control. During scene to scene navigation, content across all experience layers are unaffected by the chosen transition effect. Their contents remain on screen. Media like video and audio will continue to play throughout the transition without interruption. Experience layers can be used to create a full screen background but there are multiple background options and your choice will vary based on needs. See this article for details. By default, every new scene starts with a single scene layer, named "Layer1". Items within the same layer are at the same depth along the z-axis - i.e. along the axis coming in and out of the screen. For those items in a layer that are set to either Free or Unpinned, interaction with those items will cause them to jump in front of other items in the same layer. A scene must have at least one layer. To remove a scene layer, either 1) right-click the layer and select the Delete option in the right-click menu, or 2) select the layer and click the Delete button on your keyboard. behind all scene layers - i.e. "background experience layers"
in front of all scene layers - i.e. 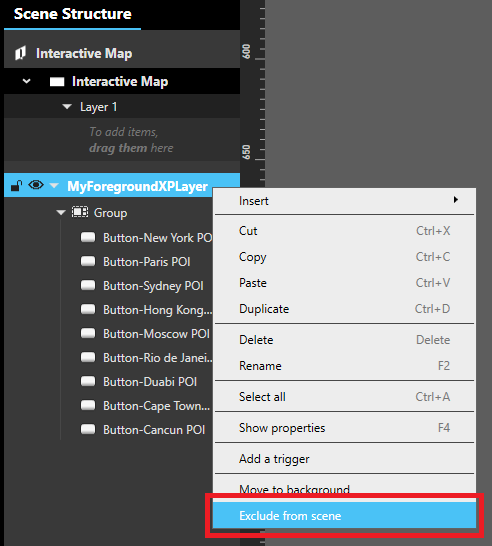 "foreground experience layers"
To remove an experience layer, either 1) right-click the layer and select the Delete option in the right-click menu, or 2) select the layer and click the Delete button on your keyboard. 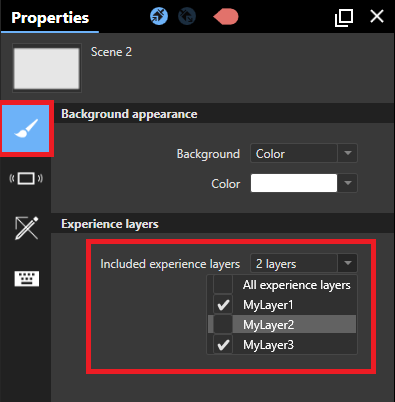 right click on the layer and select "Exclude from scene"
Whether in the scene or in the experience foreground/background, the process for reordering and renaming layers is the same. 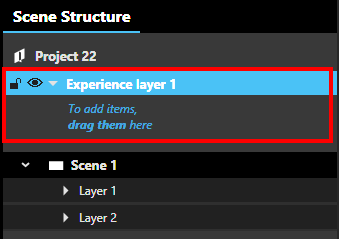 To reorder a layer: Drag-and-drop the layer to any location within the Scene Structure panel. Layers can be moved to anywhere within the scene, the experience foreground and the experience background. 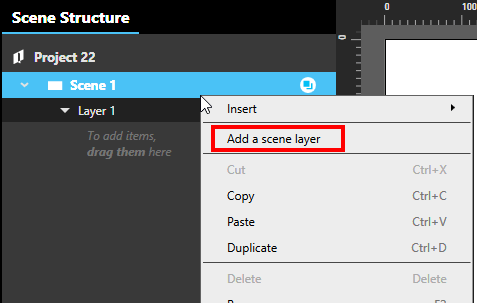 To rename a layer: Select the layer in the Scene Structure panel then either 1) click the F2 button on your keyboard, or 2) right-click the layer and select the Rename option in the right-click menu. Whether at the scene or experience level, layers have a set of associated properties, triggers and actions. Item shadow effect: Specifies the type of 3-dimensional shadow cast by an item in the layer as it is moved. Drop shadow: The item casts a shadow both when stationary and when moved. Reset all asset properties: if during scene-to-scene navigation, the experience layer is excluded from the staring scene but included in the destination scene, all content in the experience layer - both assets and collections - will be reset to their original state. Show usage animation Specifies whether an item, when first appearing on screen, should play a little animation illustrating how to interact with it. Is hidden Raised when this layer is hidden. Is shown Raised when this layer is shown. Hide Hides the specified layer. Show Shows the specified layer. Toggle visibility Toggles visibility of the specified layer.